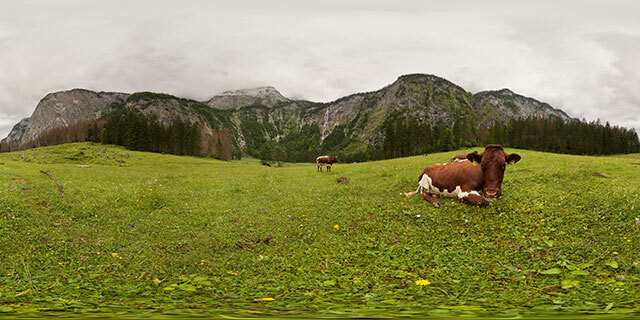 360° VR panorama of cows resting in a meadow near Röthbachfall in Berchtesgaden National Park, South Bavaria. Röthbachfall is the highest waterfall in Germany, with a vertical drop of 470 metres (1540 ft). The area is surrounded by mountains, and is most easily accessed by taking a boat across the nearby Königssee. 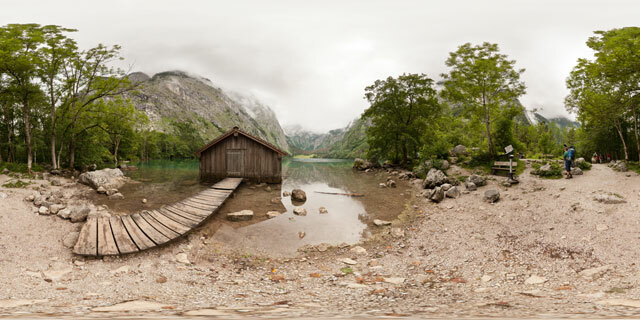 360° VR panorama by a wooden boathouse on the western shore of Obersee, in Berchtesgaden National Park, Bavaria. The lake is enclosed by tall mountains to the south and north, and is only really accessible by taking a ferry across Königssee, to the north-west. Thankfully ferrys run regularly, making the spot a popular location for tourists to visit and enjoy the alpine surroundings. 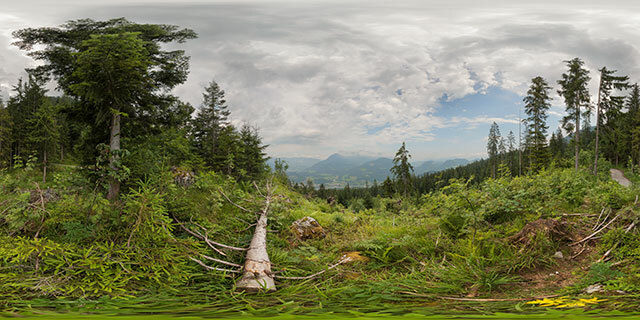 360° VR panorama looking out north-east from part way up Kehlstein, in Bavaria, Germany. Kehlstein is a 1,834 m subpeak of the Hoher Göll mountain. Although this panorama was taken relatively low down on the mountain, a break in the tree cover provides good views. In the image you can see the town of Anzenbach in the valley below, with the mountains Kneifelspitz to the north-east, and Rauher Kopf to the north-west. The hillside of Kehlstein is mostly covered with Fir trees, but in this clearing you can see a variety of trees and plants growing.